Laterality in Sports: Theories and Applications summarizes recent research on the neurophysiological foundations of handedness, and how left or right lateralization (affecting primary hand use, foot use, and eye use) affects motor control, performance outcome, skill acquisition, and achievement of sports expertise—both for one-on-one sports and team sports. 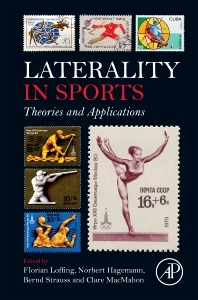 As laterality research has matured, greater focus has been given to applications in human endeavours and, in particular, sport. The book examines performance within individual sports, and discusses the coaching ramifications of coaching to a specific lateralization preference. Researchers in sport psychology, cognitive psychology, motor control, neuropsychology and neuroscience. Why Would Left-Sided Athletes Have an Advantage in Sports? How Do We Identify and Assess Asymmetries? Florian Loffing is a post-doctoral fellow at the Institute of Sports and Sports Sciences of the University of Kassel (Germany). He obtained his PhD from the University of Muenster (Germany), Department of Sport Psychology, for his dissertation on performance in left- and right-handed professional tennis players. Florian’s research interests focus upon the perceptual-cognitive processes and mechanisms that underlie skilled performance in sports. This specifically includes the examination of laterality effects on visual anticipation, decision-making and high achievement in the elite domain of sports. Florian’s work has been published in several peer-reviewed journals including PLoS ONE, Journal of Sport & Exercise Psychology, Human Movement Science, Acta Psychologica, and Journal of Sports Sciences. Norbert Hagemann is currently Full Professor for Sport Psychology at the University of Kassel (Germany). He received his PhD from the University of Muenster for his thesis “Heuristic problem solving strategies of team coaches”. Prof. Hagemann is studying the cognitive processes underlying how athletes perform in training and competitive situations. The focus is particularly on their perception and attention processes. Prof. Hagemann has been working on the topic of laterality for several years. This research has been supported by several research grants from the German Research Foundation. He publishes and reviews regularly papers in high-impact international peer-reviewed Journals. Clare MacMahon is a senior lecturer and Head of Sports Science at Swinburne Institute of Technology in Melbourne, Australia. She has an undergraduate degree in Psychology from McGill University, and post graduate degrees in Human Kinetics and Human Biodynamics from the University of Ottawa, and McMaster University. In her work on sport expertise, with an interest in decision making and the cognitive components of performance, Clare has conducted research in labs in Canada, the US, Belgium, Germany and Australia, working alongside world leaders in the area. Her work has been funded by the Social Sciences and Humanities Research Council of Canada, and the Australian Research Council.